Vijayadashami or Dussehra falls on the 10th day of Navaratri which is actually celebrated as the day of the good over evil. Also, it is the most cherished day for starting new things or having a new beginning especially when it comes to education and learning. People follow good old traditions by placing books and tools before the god and taking back after the worship by believing the fact that any knowledge cherished on the day of Vijayadashami will lead to success. Vidyarambham (“Vidya” means knowledge, “Arambham” means beginning) is a tradition followed in Vijayadashami day where children are formally introduced to world of education & learning. Kids used to join some academy to learn arts, music, dance, languages and other arts on this good day. Hence, Vijayadashami is considered to be the most auspicious day to initiate new learning process! On behalf of Vijayadashami, Zuan Education also started its premium batch for Digital Marketing Training Course to professionals those who want to master in digital marketing with hands-on learning experience. People who want to pursue our Digital Marketing Course Premium Batch can enroll now by following the link below. 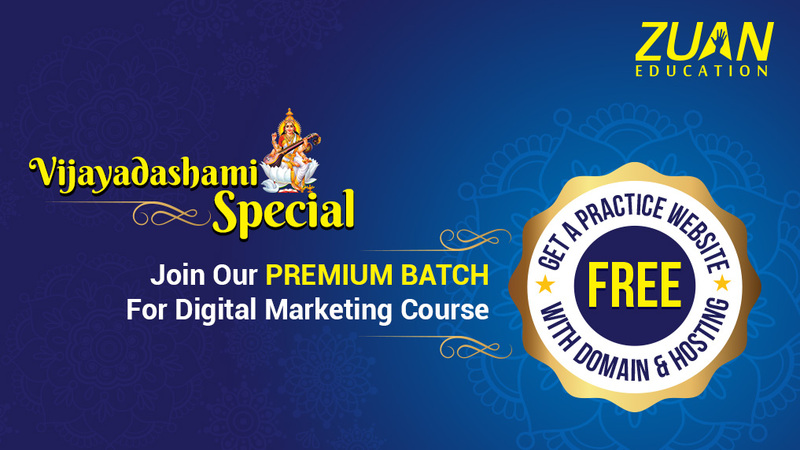 Take your career to the next level with our Premium batch for Digital Marketing Course! We wish every learner who is into the world of learning, a bright future and success in their career!